I enjoyed the new Star Wars movie quite a bit, but I still had to chant “alternate universe” a lot—because I like the Expanded Universe of the novels. As I mentioned in my movie review, the movie sent me running to read a Timothy Zahn book, just to bring some balance back. So I pretty quickly read Survivor’s Quest (and took a while to post the review…), the chronologically-last Zahn Star Wars books, after already having read the previous five he wrote. And it really did feel so nice! 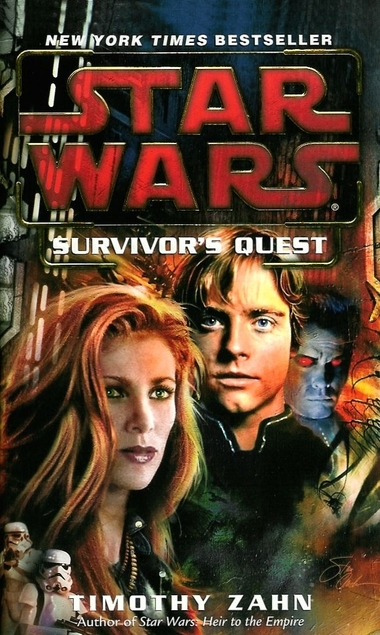 By this book we’ve reached some twenty years beyond the original trilogy (not that you can tell from Luke’s face on the cover…) This one focuses exclusively on Luke and Mara Jade, now married for three years. They join an expedition to find the remains of Outbound Flight, a colony ship sent 50 years ago in an (unsuccessful) effort to reach another galaxy. It swiftly becomes clear a saboteur is aboard the expeditionary ship, with a whole host of possible suspects. Reading this book definitely fulfilled my goal—it just felt so comfortable to read a story about Mara Jade (probably the break-out star original character of the Expanded Universe), where Luke is training up a new generation of Jedi. We didn’t get to see Han and Leia, but we know they’re out there. I loved that. And it was a good book apart from my particular comfort zone desires here. In many ways it’s a Star Wars mystery. Someone is sabotaging the ship, and Luke and Mara need to figure out who, with many suspects and only a handful of not very helpful clues to guide them. Well, and the Force of course, but that’s not as conclusive for gaining clues to solve a mystery as you might think. So there’s good suspense, some nice twists, and a lot of action, especially near the end. And lightsabers are used plenty. One odd little element (well, odd to me) is when Luke worries because the old Jedi order forbade marriage—and obviously, he’s now married to Mara. It feels odd to me because any reference to the prequels turning up in the novels—yeah, I’d just rather not be reminded those movies exist. (And when the original Thrawn Trilogy, Zahn’s landmark books, was written, they didn’t.) But in this case, it works out all right—because in the end, Luke decides that’s not the right rule for his new Jedi order. So we kind of just mentioned it to throw it out. I approve! I approved less of the body count that piled up by the end of the book. I don’t want to give away who the enemy is, but suffice to say there ends up being large numbers of enemy fighters, and a great many of them end up killed by Luke or Mara—in hand-to-hand combat, pretty casually and without qualms. Granted, the enemy are the first aggressors and show themselves to be extremely ruthless, but…still. I’d like the good guys to be more bothered about taking lives. Maybe I’m used to Star Trek. Lightsabers don’t have a stun setting. I’m not sure how I feel about the exclusive focus on Luke and Mara. I’ve read Star Wars books that go the other direction, trying to layer in so many different characters and plot threads that you end up barely seeing anyone (and it gets confusing). So on the one hand, I liked just having the two characters and the one major plot thread. But…I did miss Han and Leia. So I may need to find another Star Wars book to read soon!